How typically Javier Hernández, stealing across his central defensive marker to score at the near post. The Mexican did it twice on Friday night, netting his first with the instep to the goalkeeper’s right, and then a flicking neatly over his opponent with the outside of his boot to earn a 2-2 draw with Nigeria in Houston. Friendly it may have been, but the old instincts die-hard; Hernández has always been an outstanding finisher. The international double came just a day ahead of Chicharito’s birthday, with the striker turning 25 on Saturday. And with the brace he secured his 32nd international goal in just 47 appearances – continuing a remarkable scoring record during four years as a senior international. Jared Borgetti’s Mexican record of 46 in 89 appearances for El Tricolor will surely be broken – possibly before World Cup 2014 is over, with the player also featuring in the Confederations Cup this summer. Yet, no longer the fresh-faced boy who arrived at Old Trafford shortly after the 2010 World Cup, Hernández faces a potentially career-defining choice this summer; stick at Manchester United with a new manager at the helm, and potentially fresh opportunities arising, or twist in search of more regular football, probably on the continent. Indeed, the striker started just nine Premier League games in the campaign just concluded – 22 in all competitions – far too few for a player whose finishing quality has oft been lauded by former United manager Sir Alex Ferguson. In fact the Mexican’s position at United’s became even more marginal towards the denouement of Ferguson’s reign. Hernández started and finished just two of United’s last 10 matches this season – the dead rubber on the final day of the campaign and the FA Cup replay with Chelsea. Worse, Hernández was afforded less than 15 minutes on the pitch in each of his last four substitute appearances for the Reds. With Robin van Persie prefered at number nine, Wayne Rooney in the deeper role at 10, and Danny Welbeck the most flexible of United’s quartet of strikers, it is perhaps unsurprising Hernández has found game-time increasingly sparse. It comes as little shock, then, that the vultures are circling on the continent; Juventus the latest club reportedly interested in adding the Mexican to its roster next season. Long-time admirers Real Madrid and neighbours Atlético – in search of Radamel Falcao’s replacement – might also seek to prize away United’s fourth-choice forward this summer. Relocation away from Manchester might suit the striker too – there is little satisfaction to be gained sitting on the bench for around two-thirds of the season even if United continues to challenge on all fronts. Hernández’ nightmare scenario, if he continues to spend more time on the club bench than off it, is losing his place in the national team ahead of next summer’s World Cup – perhaps t0 Aldo de Nigris, youngster Raúl Jiménez or veteran Omar Bravo. Still, Ferguson’s decision to acquire the unheralded 21-year-old prior to World Cup 2010 proved inspired. It also afford Hernández his first shot at European football; a fact that has secured the Mexican’s loyalty despite the rapid rise to fame. “The impact Sir Alex has had on me is massive,” admitted the striker recently. “He gave me this big chance to play at the biggest club in the world. He has taught me a lot and I only have thankful words for him. I have won two league titles in three years and played in the Champions League final. Not one to rock the boat, Hernández is unlikely to push for a transfer this summer, but with the debt of loyalty to Ferguson now broken, nor are the ties to the club as strong as they once were. No longer is it unthinkable that the Little Pea moves on. Moreover, with David Moyes typically preferring a single-striker system, Hernández will likely see no increase in match time under the new manager than he has in the past three seasons. After all, van Persie is a prerequisite leading the line, while Chicharito is really only effective playing ahead of a deeper lying partner. It means the Mexican is always likely to be the Dutchman’s understudy if Moyes repeats the tactical system deployed at Goodison Park, where Marouane Fellaini was deployed deep behind Nikica Jelavić. Even if Rooney departs this summer it is Japanese playmaker Shinji Kagawa, who is desperate for an opportunity in his natural role at ’10’, that will likely benefit the most. In this Hernández suffers for being the least flexible of United’s front four; a natural finisher usurped by those who offer a more rounded contribution. It is a developmental waypoint that outgoing manager Ferguson identified as the campaign came to a close. “I hope he feels he’s made a contribution because we all feel he’s done that,” said Ferguson. Certainly, the player has become more confident in his contrition outside the box in three years at Old Trafford. From the player who often tried too hard by coming deep, to one that successfully finds his team-mate with 77 per cent of passes in opponent’s half. But it is with 18 goals in all competitions this season that Hernández’ contributed most, whatever the growth in his game. Moyes is surely loathe to forego a player who scored key goals against SC Braga, Chelsea, Aston Villa, Newcastle and Swansea City during the campaign. And at just 72 minutes per Premier League goal involvement, including 10 goals and three assists, Hernández boasts by far the best rate of any player to have scored 10 or more during the league season. It is a record that should prompt the new manager to eke at least one more season out of the Mexican, whatever the temptations on offer from clubs abroad. There is a temptation in familiarity; to paint large brush strokes, to pigeon-hole, to find a box of mutual convenience. This is true of football, a sport in which punditry of the vanilla so dominates; perhaps more so than in any other mass cultural event. In this there can be no surprise that Manchester United’s summer signing, Dutchman Robin van Persie, has brought inevitable comparison with a compatriot of yesteryear. It shouldn’t take the former Arsenal striker long to break out of this metaphorical confinement though, not in fashion that van Persie has begun his United career, with 11 goals in 15 games. For the record, it took Ruud van Nistelrooy 19 games to reach the same tally. van Persie may not have scored in United’s 3-2 victory over Aston Villa on Saturday evening, but the 29-year-old did almost everything short – striking the bar with a bullet header, and then again with a fierce long-range drive in the second period. Indeed, while Javier Hernández saved United’s considerable blushes at Villa Park with a second-half hat-trick – dubious goals panel pending – it is van Persie who remains central to the Reds’ success or failure in the months ahead. Fortune is a little short of the ideal expression given United’s lavish expenditure on the Dutchman, but Sir Alex Ferguson will certainly feel capricious – van Persie has been pivotal in the Scot’s team securing 16 points from losing positions this season. “His confidence is just sky-high at the moment,” observes United veteran Ryan Giggs. van Persie, together with Wayne Rooney, and Hernández, must continue the pattern, especially given United’s woeful defending this season. It takes not a cynic to observe that Ferguson’s call for his team to score 100 Premier League goals this season may be short if his team continues to play in a fashion that invites goals at the other end. Villa Park was no exception. Despite the tragic-comic nature of United’s defending Ferguson will feel comfort in Chicharito’s return to form in recent weeks. van Persie’s rapid integration into the Old Trafford scene had begun feel like a dependent relationship – and not of the mutual kind. Goals spread around the side offers comfort, with Ferguson expecting more than 60 strikes between his leading men this season, as United seek to win from the front whatever the consequences at the back. Yet, it is van Persie who is now expected to strike against the very best in the months ahead – a burden bestowed not by his manager, but from the striker’s peers at Old Trafford. The Dutchman is now a lionised figure in a United dressing room packed with seasoned internationals. In Birmingham, on Saturday night, van Persie once again led United’s forward line effectively, although with little personal luck. On this occasion it mattered little as United came from two goals down to secure a four-point Premier League lead, with Hernández bringing a stunning conclusion to the game late in the second period. United should never have been so troubled by a mediocre Villa side, but such is the way this season, with the Reds seemingly content to play every match as a cup tie of folklore. “It reminded us of a cup game here a few years ago when we were 2-0 down,” said Ferguson of United’s latest victory comeback. United’s won’t “always do it” of course, not against domestic and European opponents of a higher quality. In that there is a salutary lesson; admirable though Ferguson’s commitment to attacking football is this campaign, there has rarely – if ever – been a successful side whose basic defensive make-up is so lacking. In this van Persie has also become pivotal. At Braga, in midweek, van Persie’s introduction reshaped – and refocused – Ferguson’s side as United once again came from behind; during the second period at Villa the Dutchman’s movement proffered Hernández the space to fire the Reds back into the game. There is a warning though. In Portugal United’s attacking play was blunt for an hour without the Dutchman. For all the inherent firepower, United may still need to find a way to score without the now talismanic forward. Hernández’ impressive haul in the Midlands is certainly a positive start; the beginnings of a burden better shared. Sir Alex Ferguson began the season with seven strikers; the Scot could end the year with just three, and none of them currently in scintillating form. Injuries leave Ferguson with just two senior strikers for Manchester United’s visit to FC Basel in the Champions League this week – Wayne Rooney and Danny Welbeck – but potential departures may reduce the Scot’s options even further come January. It is a concern for which there is no easy fix as United continues to grind out single-goal results. Javier Hernandez’ sickening and unfortunate injury during the Reds’ 1-0 victory at Aston Villa on Saturday has reduced the Scot’s attacking options, with Michael Owen also on the sidelines until the New Year, and Dimitar Berbatov missing the next fortnight after suffering a recurrence of an old ankle injury against Crystal Palace. The early injury to Hernandez, who rolled over on his left ankle and is believed to have torn ligaments, will keep the Mexican out of action for at least a month, according to Ferguson. But that could be an optimistic prognosis; those who have suffered similar injuries, including Robin van Persie and Jack Rodwell in recent seasons, spent far longer on the sidelines. Meanwhile, Owen, who strained his left hamstring in United’s 2-0 Champions League win over Otelul Galati at Old Trafford, is unlikely to play again this side of a busy Christmas programme. With Berbatov set to miss matches against Basel and Wolverhampton Wanderers, Ferguson will fall back on Welbeck, who has only just returned from injury, to partner the misfiring Rooney in Switzerland. Still, Ferguson chose to reflect on the positives from United’s controlled but ultimately narrow victory over Villa on Saturday evening. “I thought we deserved the victory. We had great possession at times and I think we were a bit wasteful with chances we had in the second half,” said Ferguson of United’s victory at Villa Park. Injuries will do little to help United’s attacking rhythm though, with Ferguson’s side having scored just once in each of the last seven Premier League games since derby defeat to Manchester City in October. It is a period in which Rooney has failed to hit the net, although the 26-year-old Scouser has frequently been deployed in central midfield. Attacking injury problems could open the door to Mame Biram Diouf and Federico Macheda. Yet, neither made the bench for United’s fixture at Villa, or indeed, has started a game in the Premier League this season, and Ferguson is expected to sell or loan the pair come January. With just 16 matches remaining in the reserve season it will aid neither man to remain at the club. “The problem is the type of reserve league we have now, it’s really a youth league, and that is a big problem,” added Ferguson after defeat to Palace last week. “It bothers me in the sense that the level of training we do was let down. For us it was Rafael’s first game, Darron Gibson’s first game, Mame Diouf’s only played four games this season, Macheda only his third game. That’s not enough football to play in the quarter-final of a League Cup I’m afraid. That caught us and I was surprised of the level of fitness of Crystal Palace against us. In terms of match play we were certainly short. Yet, while Macheda remains in Ferguson’s long-term plans, it is surprising Diouf has any future at the club nearly two years after joining for around £3.5 million. In that period the Senegalese striker has made nine United appearances, scoring one goal. In between joining and last month’s disaster against Palace there was the unsuccessful loan spell at Blackburn Rovers, where Diouf scored six times in 26 games. Three of those came in a Carling Cup tie against then Championship side Norwich. Ferguson is unlikely to make any return on the investment. Macheda, meanwhile, played only his second senior match for the club in the past year against the Championship side. The Italian is still only 20, but suffered for a six month loan spell at Sampdoria, with i Blucerchiati relegated to Serie B at the end of last season. These likely departures leaves Ferguson hoping that his injured senior strikers return soon, and that they hit the ground running. Javier Hernández will sign a generous new contract that will make the 23-year-old a multimillionaire according to the player’s agent. The deal is reward for an outstanding first season at the club and protection from overseas predators. Indeed, with Real Madrid reportedly sniffing around the player, Manchester United has moved to quickly bring Hernandez’ pay in line with more senior earners at the club. The Mexican becomes the 13th squad member to sign a contract extension in the past year as Sir Alex Ferguson continues to evolve his resources. But with Hernández suffering a difficult start to the new campaign after a curtailed pre-season, injury against Chelsea and international commitments, the really hard work starts now. No longer the new kid on the block, Hernández’ strengths and weaknesses are well known. Now, with an £80,000-per-week contract freshly inked, Hernández faces an all new kind of pressure: one to justify the faith, and another to exceed ever inflated expectations. “We have renegotiated Javier’s contract and he is now committed for five years with Manchester United,” said agent Eduardo Hernández. “The initial contract was good for Manchester and for Javier because it enabled them both to see if they could fit together and if he could achieve what was expected of him. Both sides have met their expectations and United were happy to reward Javier after his very good performances last season. Hernández scored 20 goals in 45 games last season following a £7 million transfer from Chivas Guadalajara last summer, a stunning performance all the more remarkable for a player brand new to European football. But that performance, and the positive words of Sir Alex Ferguson have raised expectations of an even more dynamic second season at Old Trafford. Indeed, the media and supporter criticism of the player is likely to be felt should the youngster suffer anything close to the clichéd ‘second season syndrome’. Yet, there is something in the player’s personality – both charming and determined – that suggests United’s marksman will not be long the relative doldrums. After all, any challenges to date this season have not been of the Mexicans own making. Hernández suffered concussion on United’s pre-season tour of the United States, which he began late after the Gold Cup in any case. Then a shin injury, dead-leg and two bouts of international fixtures have helped little in the Mexican’s search for rhythm. The latest trip, a 12,000 mile round trip to Brazil, with the international playing the full 90 minutes on Wednesday night. But there is also work to be done. The player’s over-eagerness to be involved in all aspects of play has waned a little, with a greater focus on movement in and around the last third playing to Hernández’ genuine strengths. Yet, the 23-year-old remains a poacher above all, offering movement, pace, and outstanding finishing but requiring support. After all, the Mexican is hardly likely to work the channels, hold up the ball or lead the line alone. None of which Ferguson’s scouts recommended the player for, of course. Moreover, Hernández now faces a genuine battle with Danny Welbeck for a place in Ferguson’s team. Certainly for the weekend fixture with Liverpool the Mexican’s jet lag may well count against a starting berth. Then there is Welbeck’s progression in a year at Sunderland, which has brought five goals in as many games. The Longsight-born youngster has also forced his way into the England reckoning, coming on as a substitute against Montenegro for England last week. Neither Hernández’ new deal, nor Welbeck’s progression, is good news for Dimitar Berbatov of course, with the 30-year-old Bulgarian starting just two of United’s nine matches in all competitions this season. Berbatov remains the only senior United player to not hold a long-term contract, with the player’s dealing running out in June 2012. Although the club holds an option to extend the striker’s contract beyond next summer it must be taken up, according to reports, before January when the Bulgarian becomes free to negotiate with interested parties. Should Welbeck continue his upwardly mobile performances, Hernández’ hit the ground running after the international break and Rooney keep his powder dry, Berbatov’s chances of making Ferguson’s first team will diminish further. It may precipitate a sad end to one striker’s United career, while another’s is just beginning to ignite. It is reliably said that off the field Chelsea defender Ashley Cole is mild mannered and pleasant company. Engaging even. His on-off-on again wife may not always agree with the 30-year-old’s sexual proclivities but that, of course, is an aside. On the field the left-back’s rapidly waning ability has now twice been exposed in successive outings against Manchester United. The player’s reaction: violence of the crudest kind. First, Antonio Valencia so humiliated Cole during United’s victory over the Londoners at Old Trafford last April that the former Arsenal player must have been relieved the Reds winger did not start Sunday’s Premier League game. Cole’s moment of deliverance was short-lived though, with Nani again showing the progress the Portuguese has made over the past 18 months with a man-of-the-match performance on Sunday. By the end of the fixture, so frustrated was Cole with Nani’s mesmerising skills that the former Arsenal left-back lunged, two-footed and high, into Javier Hernández’ shins. The sickening replay showed the Mexican striker’s leg buckle, with a break only a miracle and industrial-strength shin pads away. Cole’s tackle was crude, aggressive, deliberate and all the more sickening for the arrogant and dismissive reaction delivered by both the defender and his captain John Terry. The pair surround referee Phil Down, arguing fiercely that no foul had been committed. Cole’s attitude was no fake, of course. The player genuinely believes that he did no wrong, despite the studs-up challenge that will leave Hernández out of action for weeks. Plus ça change from Chelsea’s clique of big egos, as Roy Keane call them this week, whomever the manager of the moment. Understandably, Sir Alex Ferguson was furious,both with the lack of penalty awarded. Technically the ball was about a yard out of play, with Hernandez’ lashing the shot into the side netting but the yellow card issued to Cole is indefensible. Adding insult to the Mexican’s injury, Cole will face no further sanction after referee Dowd refused to dismiss the former Arsenal player. “It was a shocking challenge,” Ferguson told Sky Sports. “The referee has booked him for it so I don’t know why it wasn’t a penalty. I must ask him. He is very reckless at times, Ashley Cole. He is committed, of course, but being committed you can sometimes go over the edge a bit. That was an example of that. It was a shocking tackle, an absolutely shocking tackle. The Football Association confirmed, Monday, that Cole will face no further action. FA rules, for the little that they are worth, do not allow for a yellow card to be upgraded retrospectively. Had Dowd taken no action in an incident he clearly did not see then the FA would have been able to charge Cole with violent conduct, resulting in a well deserved three-match ban. Yet, more embarrassing than Coles’s reaction or the FA’s inadequacy is the excuse made by 33-year-old Chelsea manager André Villas-Boas. Quite unbelievably, José Mourinho’s protegé blamed the incident on the officials for ruling United’s way on two highly marginal offside decisions. The emotion of going behind, claimed Villas-Boas, was too much for Cole to handle; lashing out was all that could be expected of the defender. “Maybe he wouldn’t get sent off if the linesman does his work,” Villas-Boas told the Telegraph. It is, of course, a feeble excuse made all the worst by Cole’s decade-long history of two-footed lunges and aggressive claims of innocence. Cole is a man whose level of entitlement has always been far off the scale, even for a pampered footballer. It’s not even the first time the defender has gotten away with a similar tackle against United. The FA for its part is happy to hide behind the organisation’s self-imposed rules, designed to protect referees, but in fact achieving the exact opposite. There is little doubt that had Dowd or his Assistant seen the incident more clearly then Cole wold have seen red. The FA could correct the human error and right an injustice. Yet the organisation was desperate to jump on the media bandwagon after Wayne Rooney’s ‘sweargate’ at Upton Park last season. It all goes to show, to paraphrase a popular cartoon, that horrific deplorable violence is OK, as long as no one says any naughty words! While the focus of Manchester United’s summer for many supporters has been the search for the ‘new’ Paul Scholes, Wayne Rooney’s hairline or even how to pronounce David de Gea, for Javier Hernández it may well be how to match or improve on a fantastic début season at Old Trafford. The Mexican, who scored 20 goals in 45 games last season, arrived with little expectation but announced himself on the biggest stage with a fortuitous goal against Chelsea in the Community Shield. The goal proved a sign of a season to come. Yet, after the bright start Hernández – Chicharito – struggles with the Premier League’s physicality, especially in United’s disappointing 2-2 draw at Craven Cottage. It said much for the player’s quality and determination to improve that Hernández reassured Ferguson with a magnificent finish away from home against Valencia to seal an unconvincing win in September. Arguably, however, the real turning point in Hernández’ season was the fantastic double against Stoke City at the Britannia in October. “There was a game that really made me realise that I could have an interesting season. It was the match against Stoke City in which I scored twice,” concluded the 22-year old striker in May. From a position of strength the Mexican dislodged top scorer Dimitar Berbatov in Sir Alex Ferguson’s starting eleven and scored vital goals in both league and cup competitions. In total the 20 goals allowed Hernández to join the great Ruud van Nistlerooy in reaching the landmark in his first season at Old Trafford. van Nistelrooy went on to score 150 goals in 200 starts for United. The immediate challenge for Hernández is to overcome the real risk of burnout so early in his career. Chicharito has been subjected to a grueling summer after a first physical season in England. First the late finish to the campaign against Barcelona at Wembley and then a highly successful Gold Cup campaign with Mexico, in which Hernández netted seven times in six games. The striker stood out throughout the competition, despite the arguably poor quality of opposition. In the process Hernández won player of the tournament; an outstanding accolade regardless of the competition. Ferguson will be thankful that Chicharito was left out of Mexico’s calamitous Copa America for a fear of burnout. The Mexican football association is equally protective of its star asset. The extended break afforded to the player before he joins his club compatriots in the USA for their summer is also welcome. Ferguson is no doubt extremely hesitant to overuse the nimble Mexican on this media exercise. The scene is set for Hernández to carry his impressive summer form into the new season, although Ferguson has a plethora of options available to allow the Mexican ample time recover full fitness. Perhaps the biggest hurdle for Chicharito to now overcome is the clichéd ‘second season syndrome’ – other players have broken in to United’s first team only to fade away. In fact Hernández could find no greater motivation than in the squad itself, with Michael Owen, once the darling of world football, now little more than Old Trafford squad filler aged just 31 Old Trafford. Hernández has a similar playing style to a young Owen – a game built on playing off the last shoulder of the last defender, matched with deadly pace. Perhaps Ferguson’s real love for Owen is to school Hernández in the fine art of finishing. Regardless of that particular theory, the coming season remains the biggest test of Hernández’ resolve to date. Teams across the continent will have improved their understanding of United’s potent striker. “I do not rest on my laurels. I want to do even better next season. I want to help this club to make history,” added Hernández after collecting the Supporters’ Player of the Season award in May. Ferguson and the supporters can only hope his game has improved too. Sir Alex Ferguson will surely greet Javier Hernández’ Gold Cup win with mixed feelings. Delight for a player who has burst onto the international scene as a genuine star; concern that the 22-year-old striker faces burn out after seven summer matches that crisscrossed North America and racked up more than 8,000 miles on the continent alone. There will be relief then that Chicharito is set to miss Mexico’s invitational appearance at this summer’s Copa America, with El Tricolor set to field an experimental squad in Argentina. While Mexico’s status as an invited participant means head coach José Manuel de la Torre has no right under FIFA statutes to call up players not released by their clubs, Ferguson would hardly relish creating friction at this stage of Hernández’ Manchester United career. On a personal level the summer could hardly have gone better for the United striker, who scored seven goals in as many games to fire Mexico to the gold medal. Hernández may not have scored in the final – a 4-2 win over the ‘home’ side USA in Pasadena on Saturday night – but the striker picked up the tournament’s Golden Boot award and its “Most Valuable Player” gong in any case. Hernández’ summer feat takes his international total to 21 goals in 29 appearances, adding to the 20 goals the 22-year-old scored in all competitions last season. Far cry from thoughts of quitting the game as the Little Pea struggled to make the break through at Chivas Guadalajara two years ago. Such is the player’s rise to fame in the past year that Hernández could make almost any team in the world. “I wasn’t playing the minutes that I wanted to at the time and the coach wasn’t playing me. I don’t know why that was, but I was frustrated,” Hernández said after joining United in April 2010. Confidence now flows through a player who has become Ferguson’s first choice striker at Old Trafford, displacing Premier League top goalscorer Dimitar Berbatov in the Scot’s side during the business-end of last season. Yet, truth be told, the 22-year-old didn’t have the finest of games on Saturday night, suffering from an unusual profligacy in front of goal as Mexico came back from 2-0 down inside half an hour to defeat their hosts 4-2 in normal time. Perhaps the pressure finally told. Played in Southern California the match was a home fixture in name alone with the majority of a partizan 94,000 crowd cheering for the men in green. But Hernandez’ two assists in the final add to the feast of goals during the tournament, scored in a delightfully diverse fashion. The striker scored a hat-trick in Mexico’s 5–0 win against El Salvador – header, right-foot, cheeky penalty – a brace against Cuba and then the winner in a 2–1 win over Guatemala; a stunning back-heel at the near post. Showcasing’s the striker’s ability to score by whatever means, Hernández scored Mexico’s winning goal in the 99th minute – with his crotch – to beat Honduras 2-1 after extra time in the semi-final. Hernández will now be given an extended summer break by Ferguson, with the striker unlikely to feature heavily, if at all, in United’s summer tour to the United States. Fear of burn out is real, despite the limited schedule faced at United last season. In truth Hernández is likely to play more than 40 times for the Reds in the coming season, with Berbatov relegated to third choice if the 30-year-old Bulgarian remains at the club beyond the transfer window. The rest may mean disappointment for the growing army of United supporters in the states, where Ferguson’s side visits Boston, Seattle, Chicago, New York and then Washington during a two-week tour from 13 July. After all, pre-season training begins in just over a fortnight. Yet, typical of the man, Hernández is focussed on banishing any thoughts of ‘second season syndrome’ rather than soaking up his new-found global fame. “Success is written into the DNA of this club,” said the 22-year-old last week. United fans will sleep easy on that thought. Ferguson, meanwhile, has a delicate decision to make on Hernández’ eventual return to the United fold. ‘The title is ours’, not exactly Sir Alex Ferguson’s words after Manchester United beat Everton 1-0 on Saturday at Old Trafford but they could well have been. United’s late late victory, not for the first time in a season that has rarely sparkled yet promises to bring more silverware, brings the Reds to within just seven points of claiming the Premier League. Or in other words, with games against relegation threatened Blackburn Rovers and Blackpool to come, United can probably win one and lose one of upcoming fixtures with title-rivals Arsenal and Chelsea in the next fortnight. Ferguson’s position is understandably bullish after Javier Hernández 81st minute strike on Saturday. It was the Mexican’s 19th goal of a campaign that is increasingly defined by the 22-year-old’s performances. “Games are running out for our rivals and we’re up for it,” said Ferguson after Saturday’s victory over Everton. “I enjoy this critical stage of a season when we are involved in big games that come thick and fast and I think we will be OK. The thing that puzzles me is they [the media] keep saying Arsenal and Chelsea have got to play us still, like we’re going to lose to them but why shouldn’t we win those games? Why can’t we go to the Emirates Stadium and win, as we have done previously? Indeed, yesterday’s laboured win over in-form Everton should remind Ferguson’s players – as if any prompting is really needed – that points and not performances is what counts come April and May. It is a lesson so rarely learned at the Emirates. After all, despite United’s dominance against Everton there would be no Arsenal-style sympathy had United thrown away the points. Not so against David Moyes’ spirited outfit. Much as is United’s type this season, the Reds continued to probe for openings, patient in the knowledge that chances would eventually come. More than 60 per cent possession and 16 chances created against Everton, who had not lost in seven matches, attest to that. Other United sides have demonstrated more talent; few have shown more character. It is a trait for which Ferguson can taken much praise. “There is that winning attitude about them,” added the 69-year-old Scot. “We will keep our heads down and not get carried away. There are only four games left and the way they are going about their business and the effort they have shown, it gives them an outstanding chance of being champions. You can test people’s character but they keep coming through. On Hernández Ferguson rightly praised the role the sprightly Mexican has played this season. Buy of the summer? Buy of the decade more like. For all the Scot’s disingenuous talk of the transfer market’s lack of value, deliberately hiding as it does the Glazer family’s financial agenda, Hernández has proven a genuine bargain. “Javier has done better than everyone expected,” added Ferguson. After all, Hernández has not only scored late goals for United but winning goals. This is no kid, brought on with 10 to play in a dead rubber, that is helping himself to easy pickings. In his first campaign with the club, United would not be in position to win the title without Hernández. Meanwhile, Hernández is genuinely humble in his achievements, preferring to enthuse the team ethic and not his own contribution that should have brought a PFA Young Player of the Year Award. “Of course it’s a dream come true, this season,” said the former Chivas striker. “If we win the Premier League, that’s an unbelievable thing. If I could swap all the goals for us to win the league then I would do it. We know we are almost there, but we can’t afford to think like we’ve already won it. We go day by day, week by week. In that there is a false modesty of course. Hernández’ goals have taken United to within a whisker of glory. Grab more than a point over the next two matches and United supporters worldwide can start to celebrate. Surely Javier ‘Chicharito’ Hernández, who has scored 17 goals in all competitions in his début Manchester United season, is not the Ji- Sung Park of strikers? After all, notwithstanding the Mexican’s above average workrate, he doesn’t ‘put himself about’ as much. One doesn’t often see Javier Hernández popping up at the back, for example. In fact, the 22-year-old striker is consistently glued to the shoulder of last defender. Indeed, the Mexican’s attack-mindedness is what makes the youngster an excellent contributor to United’s defence. Hernández is extremely quick off the mark and by having such a pacey player staying up field, the opposition cannot drive the defensive line forward, lest a quick ball over the top catch the defence off guard. With the defence sapped, the opposition faces two undesirable options: first, commit only midfielders and forwards to the attack and have the team disjointed; or drop the team back a little to remain in contact with the defence. This, of course, relieves pressure on United. Perhaps, this is why Hernández has been preferred to Dimitar Berbatov in recent games. Despite his languid style, Berbatov is not slow but the Bulgarian does like to drop deep and pick up the ball before launching into attack. Naturally, the opposition defence can safely form a high line. Sir Alex Ferguson tried to combat the problem by deploying Wayne Rooney, who is generally a more direct player than Berbatov, further up field than the thirty-year-old Bulgarian. The solution didn’t quite work out for it put Berbatov in a completely unnatural position. In addition, Rooney is also a player who likes to drop deep and often United had two forwards in deep positions directly facing a line of defenders. Wingers could theoretically provide the thrust to drive back the opposition but defenders are much less wary of wingers for they are further away from goal than strikers. Also, to engage wingers, players of Paul Scholes’ calibre are need – the task requires accurate passing over long distance. Not only does Hernández’ obsession with the offside trap help out defensively, but also it assists Rooney United’s midfielders. With Hernández stretching the play, Rooney has a nice pocket of space from which he can influence the play. Even in a nominal 4-4-2, Rooney plays deeper than a typical striker when partnering the Mexican, which results in a more 4-4-1-1/4-2-3-1 shape. The midfield becomes staggered and such shape is much easier to maintain possession – a triangle of players can always pass around a line of players. This column has previously written on Park and argued that deploying a defensive winger necessitates a high line and high tempo game – something that perhaps is undesirable when one is actually trying to set up a defensive game. Hernández is a very good example of an attacking player who can be defensive just by the virtue of being attacking. Cristiano Ronaldo is another good example – it takes a gutsy fullback to bomb forward with Ronaldo lurking. Pundits and fans alike often argue that Park and players of his ilk, such as Dirk Kuyt, ‘take one for the team’ and that they shouldn’t be criticised for their relative lack of attacking contribution. These pundits have a point but they are also missing the fact that attack often is the best form of defence. Michael Owen will see out the final year of his contract with Manchester United during the coming season but injury and the immediate impact of new Mexican striker Javier Hernández is likely to reduce the former Liverpool forward’s role in the team. Owen, 30, appeared in 31 games for United last season, scoring nine goals. Owen’s arrival on a free transfer last summer followed a disastrous injury-plagued four year spell at relegated Newcastle United. Indeed, the animosity the former England striker created among the Gallowgate faithful is a direct result of the player’s heavy wages, huge transfer fee and lack of serious impact. Widely regarded as a surprise signing by Sir Alex Ferguson, the picture of Owen’s time at Newcastle hardly altered in his single season at Old Trafford. Injury, quite predictably, ended a campaign in which the 30-year-old rarely started. There was perhaps little surprise in that though. After all, expectations at Old Trafford were hardly high to start with. Now though the 89 cap international faces a challenge making the United squad, let alone the first team with seven strikers now on the club’s books. It is possible that Owen, still a few weeks short of full fitness, will have slipped to fifth in the pecking order by the time the striker returns to fitness, behind Wayne Rooney, Dimitar Berbatov, Hernández and even Federico Macheda. The greatest challenge to Owen’s role in the team undoubtedly comes from new boy Chicharito, who on first appearances is a fitter, younger, faster and more flexible forward. Hernández, 21, scored for United against the MLS All Stars and then against his own team for CD Chivas Guadalajara on Friday night. Although supporters’ expectations of the Mexican should be kept in check – the player is moving team, country and continent to an alien style of football – Hernández’ offers everything that Owen brings to the club, save for experience. It’s a quality Owen spoke about this week, with the former Real Madrid player entering the final year of his contract with the club, although each party has an option for a third year at Old Trafford. “I’d love this to be my last club,” said Owen, who is unlikely to return until September. “You look at Ryan Giggs and Gary Neville and you like to think you have five more years in the game. I’m 30, and I don’t want to wish my career away. In an ideal world I’d like to play out my years here. Owen needs to get fit and stay fit to challenge for a place in the United side of course. After all the player started only 10 games last season, and the Champions League hat-trick aside the player hit the net on just six other occasions. The issue of fitness is perennially a source of frustration for the player, who appears in total denial about the problems that have dogged a career. “I was fit for 43 games,” claimed the forward, who appeared in just 71 Premier League games over four years on Tyneside. In the meantime Hernández may well become another annoyance by supplanting Owen in the United squad. Could Manchester United’s acquisition of Mexican striker Javier Hernandez provide a financial boost to the debt-ridden club, with million’s of Hispanics turning away from Barcelona and Real Madrid to proffer their football love (and money) on Sir Alex Ferguson’s team? Perhaps, although probably not in the way it is often reported. It has long-been the critical refrain of United’s detractors – both internal and external – that the club has sought a marketing benefit from player purchases as much, if not more, than performances on the pitch. After all, the law of received wisdom tells us that Chinese player Dong Fangzou was bought not for his ability – it turns out he had little – but for the potential to tap into the spending power of one billion Chinese. Similar arguments are made about United’s far less hapless but no less loved South Korean midfielder Park Ji-Sung, for whom a legion of millions stay up way beyond bedtime to catch the occasional glimpse of the 28-year-old in action on Korean TV each weekend. Repeat law for US, Irish, Argentinean, Italian, African and perhaps, although unlikely, Scouse players it is said. The globalisation of football, this received knowledge says, is a gold mine to the club, with new found friends happily parting with Won, Dollar, Kroner, Rupee and Groat to wear the club colours, buy United Callypso on polyphonic ringtone and download a wallpaper. The effect of Hernandez’ financial magic dust will surely be felt in Mexico and the wider Latin world too? Indeed, the excitement generated among Mexican supporters – perhaps even more so second generation fans – by Chicharito’s appearance in a United shirt is palpable. The striker’s debut against an MLS All Star Xi in Houston on Wednesday night was met with fervor not experienced on any leg of United’s North American tour to that point. The baying hordes so associated with the club’s tours of Asia had largely stayed away from United’s trips to Toronto, Philadelphia and Kansas City, via a charity diversion in New York. Not so Houston, with the new striker’s 30 minute cameo and well-taken goal met with a frenzied response in the packed 70,000 capacity Reliant Stadium. The challenge for United’s management, however, stems from the apparent separation between fandom and revenue generation in overseas markets. It is one the club is slowing beginning to address. The passion with which United is held in Asia is undoubtedly a boon to the club, although until recently largely unmonetisable. After all, much against common wisdom but a reality nonetheless, there are very few ways in which football clubs – even those as famous as United – can generate cash from its supporters, especially away from the club’s core domestic market. Firstly, and perhaps most obviously, clubs generate cash from ticket sales. About a third of United’s £279 million revenue in 2009 came from ticket sales. It’s a cash cow the Glazer regime has milked of course, with aggregate ticket prices rising by 48 per cent during the family’s five year tenure at Old Trafford. Then there are broadcast rights, which United sells collectively to both domestic and overseas markets with the other 19 Premier League clubs. As a successful team, finishing each Premier League season within the top three to date, United garners a larger share of the pot from appearance and success fees than most other teams. It’s a reward for both success on the field and popularity off it, although the disparity between top and bottom earners in England is far less than say in Spain where Barcelona and Real Madrid account for 90 per cent of all broadcast income. Thirdly, the club makes around another 30 per cent of its annual income from commercial enterprises, including sponsorship and merchandise sales. Within this block Aon, the US-based risk-management firm who paid the club a reported £80 million over four years for shirt sponsorship, and Nike whose £315 million shirt production deal runs to 2015, are the principal partners. While millions of supporters garnered from overseas markets is a headline-grabber, the percentage contribution to the club’s bottom line is in fact minimal. After all broadcast rights are sold collectively, fans in many markets – more than 90 per cent according to the best guestimates – buy only counterfeit goods if any at all, and the much lauded digital content markets offer almost no incremental revenue streams yet. In fact the real boon to United’s commercial activity is not from individual fans’ spending per se but the brand association commercial partners garner from the country-specific exclusive partnerships the club has struck over the past 18 months. Ed Woodward’s London-based commercial team has inked a claimed £200 million worth of such deals in the past year – albeit with the benefits spread over many seasons – including sponsorship arrangements with Turkish Airlines, Singha Beer, and Collo y Toro wines. Hernandez’ acquisition is unlikely to create any significant direct revenue streams though. Shirt sales may well increase in Latin markets, but it’s doubtful that it’ll be at a rate that will herald any relevant increase in turnover. More Mexican supporters may tune into Premier League games, but with broadcast rights fixed for the next three years and sold collectively the other 19 Premier League clubs will benefit just as much as Ferguson’s outfit. United may even benefit from the occasion day-tripping Mexican tourist, although it is unlikely to fill the empty spaces at Old Trafford. Where the Little Pea’s impact is more likely to be felt by the Old Trafford bean counters – aside from his inevitable sale to Real Madrid cynics might add – is in a new addressable Latin American market for the aforementioned commercial partnerships. 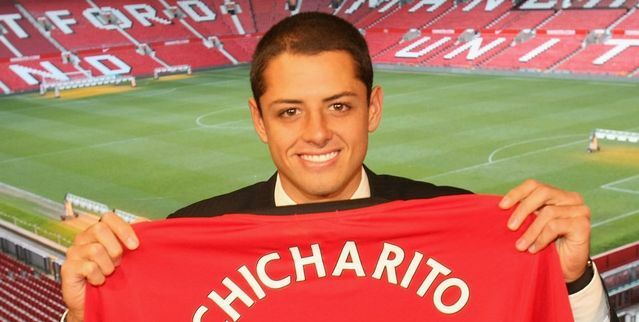 Expect to see Chicharito’s baby-face adorning giant billboards in Mexico City some time soon. It’s a market unsurprisingly cornered by Real Madrid and Barcelona to date but with the poster boy of Mexican football now firmly on the club’s roster, both Ferguson and the Glazers may have equal reason to hope he hits the ground running come August. Javier Hernández’ début in a Manchester United shirt comes tonight as Sir Alex Ferguson’s side takes on an MLS All-Star XI in Houston. The match, the Reds’ fourth on this summer’s tour, will offer the 22-year-old Mexican a brief taste of life in a United shirt after the striker trained with the squad for the first time yesterday morning. Hernández is unlikely to start though as United seeks to regain momentum lost after the 2-1 defeat to Kansas City Wizards on Sunday night. Indeed, the Mexican is likely to appear as a late second half substitute after the single training session yesterday, with the striker offered a long summer break post World Cup. Signed for £7 million without fanfare in April, Hernández’ performance in South Africa, where the former Chivas Guadalajara striker scored twice against France and then Argentina, has already set high expectations of immediate success in Manchester. The pressure was hardly eased yesterday, with Ferguson bragging that United could have paid three times the £7 million fee had the deal been concluded after the tournament. It is a message also underscored by former United great Bobby Charlton, who expressed his “great excitement” about the player during yesterday’s training session. Supporters though should be wary, with the striker’s inexperience compounding a move across continents that will require a potentially lengthy period of integration into Premier League football. After all, another South American – Diego Forlan – failed to score in a United shirt for more than 20 games before leaving the club at a knock-down price. Today, Forlan is widely regarded as one of the World’s leading strikers. It’s a challenge Ferguson at least recognises, with tonight’s game not only a chance for the US public to glimpse United’s newest star but a first step on a long road towards integration. “He joined us today and so we have to ascertain what he has been doing in the last few weeks physically, we would like to use him in part of the game on Wednesday – partly because I know there is a big Mexican population in Houston and it would be a very exciting attraction for them,” Ferguson said in Houston before taking his squad on a tour of NASA’a HQ. Hernández though is remaining grounded despite high praise from the United camp and a palpable sense of expectation among United’s support both in the US and back home. Indeed, the striker is mindful of the challenges that have faced compatriots Giovanni dos Santos and Carlos Vella on English soil in recent seasons. “I have spoken to them and they are definitely happy for me and they know that this is the most powerful league in the world,” said Hernández. “They tell me to take advantage of the situation and I should thank God for the opportunity. “I always try to see pressure in a different way – more like motivation. There are millions of people in the world who would do anything to be in my position and have this opportunity. “It’s an honour because I want to achieve big things. It’s a very nice challenge and hopefully I will be able to contribute. The MLS game arguably offers United the toughest fixture of the pre-season programme, with American star Landon Donovan leading the All-Stars attacking line-up. A Premier League side has never beaten the MLS’ All-Star team on US soil, although UK-based United fans will have to stay up late to see if United can buck the trend with the game kicking off at 1.30am Thursday morning. Hernández will then play the full 90 minutes of United’s fixture with Chivas Guadalajara in Mexico on Friday night – with a half played in the shirt of each club as part of the deal that brought the striker to Europe – before the squad flies to Dublin on Saturday for a fixture against a League of Ireland XI. It is there, in Dublin, that United’s tour squad will meet up with the club’s other World Cup players for the first time this summer. Wayne Rooney, Patrice Evra and co, have been on a punishing accelerated fitness programme back at Carrington this week. They will, no doubt, have developed a thirst for the black stuff by then. Javier Hernández formally became a Manchester United player yesterday following a successful World Cup with Mexico in South Africa. Although dumped out of the competition by Argentina last week, Hernández’ side conformed to expectations while the striker hit the headlines with two well-taken goals against France and Diego Maradona’s side. Hernández, also known as Chicharito – the ‘Little Pea’ – now joins United amid much higher expectations than just a few short weeks ago, with the 21-year-old’s relative obscurity evaporating by the game following nine goals in his first 17 international games. Indeed, while the Mexican’s £7 million acquisition was generally viewed as ‘one for the future’, with a first season sacrificed to bedding in, the striker’s growing maturity may proffer an immediate first team opportunity. It’s exactly this scenario that accelerated the United’s move for the player in April, with the club concerned that an excellent World Cup performance would impact the striker’s eventual price. Driven by the new economics at the club perhaps but a smart move if the player’s undoubted potential is fulfilled. Hernández’ immediate opportunities will depend on how quickly he adapts both to life in England and the pace of the Premier League. Fleeting glimpses in South Africa confirmed the striker’s excellent first touch, lightening quick pace over the first 10 yards and, surprisingly since the Mexican stands at just 5’7”, a Tim Cahil-esque. Good form in pre-season might yet accelerate the player’s progress yet further. It’s a view held by former United striker Frank Stapleton, who played 288 games for the club following his 1981 £900,000 transfer from Arsenal. “He has a good opportunity now to hit the ground running in England,” Stapleton told the Manchester Evening News yesterday. “Time will tell how he handles that. But the good thing for him is that Sir Alex Ferguson knows just how to introduce young players. “If the player shows up well early on in pre-season then the manager might just says let’s go with him. Players find their level. “It might start well for Hernandez and then he peaks and there is a reaction. But Fergie will see that and know it is time to give him a breather. “He might not have considered Javier for an immediate impact. Mexico’s second round elimination and the relatively short game-time the pacey striker gained in South Africa – three substitute appearances and one start – means that Chicharito could play some part in United’s summer tour to North America and Mexico. United’s game against Hernández’ old club Chivas, in Guadalajara on 30 July, may well be the romantics’ choice for the player’s club début, with Ferguson offering each of his World Cup players a full month’s holiday. Hernández’ United future also significantly depends on Ferguson’s tactical outlook for the new season. With the United manager rarely deploying two strikers and the World Cup confirming 4-4-2 is effectively dead at the highest level, Chicarito’s role may be restricted to that of Wayne Rooney’s back-up. With Dimitar Berbatov, Michael Owen, Federico Macheda, Danny Welbeck and Mame Biram Diouf already on the books the Mexican will need to hit the ground running if he is to feature next season. Rumours of an impending bid for Real Madrid’s Karim Benzema will hardly help the new import’s cause. But there is, of course, a precedent for an obscure young acquisition making an immediate impact at Old Trafford – Ole Gunnar Solskjaer 14 years ago. The Norwegian scored on his debut against Blackburn Rovers and went on to score 126 goals for the club. Anywhere near that and Chicharito will prove a major bargain. Forget the crime, travel nightmares and rip-off prices; concentrate on the football. That’s the message as the World Cup opened amid the vuvuzela din in Johannesburg. There’s plenty of it, with 64 matches in total. Manchester United interest came early, with Mexico’s Javier ‘Chicarito’ Hernandéz featuring in a 1-1 draw with South Africa today. This evening, at the truly magnificent Green Point Stadium in Cape Town, French captain Patrice Evra took to the field against former red Diego Forlan and reported United transfer target Luis Suarez. It’s a cliché of course but 30 days of back-to-back matches is truly a festival of football. Magnificent. It’s a tournament with a unique character too and not just because of the incessant low rumble of an approaching swarm that is recalled by South Africans’ favourite match-day horns. The sheer local pride in hosting the first tournament on African soil is palpable. On the pitch the hosts took the lead today with a stunning opening goal in the 94,000 capacity Soccer City Stadium before Hernandez’ Mexico struck a late, fully deserved, equaliser to finally silence the banks of vuvuzela. The striker, who officially becomes a United player during the tournament on 1 July, completely missed a header six yards out only for midfielder Rafael Marquez to shank the ball home. Hernandéz, perhaps surprisingly, started the match on the bench despite seven goals in 13 internationals to date, with West Ham United reject Guiermo Franco starting up front in a 4-3-3 formation. But with Mexico trailing, the 22-year-old Guadalajara-born forward came on as a second-half substitute. The 5′ 8 in” forward showed some neat touches and plenty of movement without fashioning a chance in 17 minutes on the pitch but with Franco abjectly poor the new United star could well start against France in six days time. Meanwhile, French captain Evra vowed to win the World Cup for the motherland ahead of Les Bleus’ opening fixture against Uruguay tonight. With arguments rocking the squad this week – Florent Malouda’s anger at coach Raymond Domenech almost coming to blows yesterday – the left-back will need to demonstrate all his leadership skills to bring unity to the side. “I am very confident and I have trust in the squad,” said Evra, who was appointed captain to succeed Thierry Henry. Evra’s promotion came at the expense of Arsenal’s William Gallas, who is now refusing to speak to the media as a result. It’s a remarkable rise for the captain, who arrived at United via footballing backwaters such as Marsala, Monza and Nice. “It’s difficult to talk about one’s self but I have put in some hard work to this point,” Evra said yesterday. No doubt more hard work lies ahead if France is to match the performance in Germany four years ago when, led by the inspirational Zinidine Zidane, the French made the World Cup final. New Manchester United striker Javier Hernandéz scored against Holland in a pre-World Cup friendly and with the FA for a work permit. A day after the 5′ 7″ striker headed home a consolation goal in Mexico’s 2-1 defeat to the Oranje, United was forced to plead ‘exceptional talent’ in order to secure the required home office documents. 22-year-old forward Hernandéz joins United on 1 July but it was dependent on the FA granting a work permit today. Typically non-EU nationals must have played at least 75 per cent of his country’s internationals over the past two years. It’s a criteria that the nine-cap striker falls well short of, forcing United to ask for special dispensation under the exceptional talent rule. Strangely United called off the deal for Serbia youngster Adem Ljajić earlier this year, claiming that the FA is now reluctant to use the exceptional talent rule after widespread abuse. While Untied supporters saw Hernandéz as a brief second-half substitute against England on Monday, the Guadalajara-born player scored his fifth goal in nine internationals against Bert van Marwijk’s Dutch side, with Mexico due to face France, South Africa and Uruguay in the World Cup Group A. When Mexico’s Javier Hernandéz takes to the Wembley field tonight it’ll be the first opportunity given to most Manchester United supporters to assess the striker’s ability ahead of a July move to Old Trafford. The £7 million forward, signed from Chivas Guadalahara in April, is likely to start tonight’s friendly with England at the national stadium. Hernandéz, in Mexico’s 30-man provisional squad for the FIFA World Cup in South Africa this summer, has already scored four times in seven matches during the 21-year-old’s blossoming international career. Granted friendlies against Bolivia, New Zealand and North Korea may not reach the heights of the World Cup this summer but Hernandéz’ performances are such that he will carry the scoring burden for the talented Mexicans into the tournament. The Guadalajara-born striker comes with a strong family pedigree in international football too, with Hernández’ namesake father a member of Mexico’s World Cup squad in 1986 and grandfather at the 1954 tournament. Nicknamed Chicharito – the little pea – Hernández will come face-to-face with new team-mates Wayne Rooney, Rio Ferdinand and Michael Carrick tonight, with the trio probably asked to start by Fabio Capello in an experimental home line-up. The Italian’s side start as favourites but the well-drilled Mexicans – playing a ninth friendly of the year – should provide stiff opposition on Wembley’s cabbage-patch pitch. While Capello assesses the fitness and form of the United squad members in his group, supporters closer to Old Trafford will have their eyes on Chicarito, with the over-reliance on Rooney all too clear during the closing weeks of last season. The 5′ 7″ striker is a man in form, with 21 goals in 28 club appearances this season but speaks with the reverential air of a player not yet comfortable with his new-found celebrity status. “I got goose-bumps when I realised I would be joining Manchester United,” Hernandez told reporters this week. “Suddenly I’m going to be playing with the players I know from PlayStation and television. I’m living a dream. I thank God I am living it. Yet the striker may need to lose his inhibitions if he is to make an impact on the bigger international stage and at Old Trafford next season. With incoming transfers limited, Hernandéz will start as one of seven strikers on United’s books next season. Rooney’s place in Sir Alex Ferguson’s side is assured of course but question marks hang over five other competitors for a striking berth at Old Trafford. Dimitar Berbatov’s goalscoring problems are well documented, while Mame Biram Diouf, Danny Welbeck, Michael Owen and Federico Macheda all found their campaigns disrupted by injury. Hernandéz is likely to start United’s campaign as first back-up to Rooney, Berbatov and Owen, with Mexico’s tough World Cup group offering the striker a potential berth in the Reds’ North American tour this summer. Ferguson will give all World Cup players 28 days off but with Mexico drawn against France, Uruguay and hosts South Africa an early exit is not unrealistic. Indeed, the 21-year-old may need to grab that opportunity if he is not to befall the fate of so many young strikers at Old Trafford. Supporters tonight will get a first chance to pass their own judgement. Manchester United has announced the signature of 21-year-old striker Javier ‘Chicharito’ Hernández from Chivas de Guadalajara in the Mexican Primera División. Hernández, nicknamed ‘Little Pea’, signs for an undisclosed fee subject to a UK work permit and will join his new team-mates for pre-season training on 1 July. The Guadalajara-born forward has scored 28 goals in 68 Primera División appearances for his club and four in four for his country since graduating from the Under-20 side that played in the World Youth Cup three years ago. “I am delighted to reach agreement with Chivas to bring such an exciting young striker, who has been in such prolific form for both his club and his country,” said Sir Alex Ferguson in a statement today. 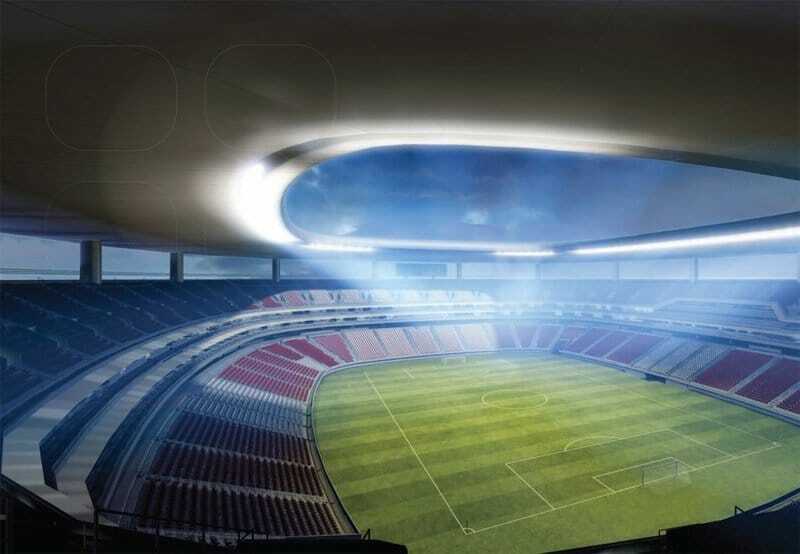 United will open Chivas’ new 45,000 Volacano-inspired stadium in Guadalajara during pre-season, although a date for the fixture has not yet been set. However, fans’ first glimpse of the new signing should come at Wembley on 24 May, when England take on Mexico in a friendly. “It’s a dream and I feel so happy,” Hernández told MUTV, after attending United’s match against Bayern Munich last night. “I’ve really enjoyed my week in Manchester – the stadium, the atmosphere at the club and the history are incredible and I want to do great things here. Hernández is United’s second capture for the new season having reached an agreement to sign defender Chris Smalling from Fulham in January. Now sing. My, my, my… Chicaritoooo, da la la la la la laaaaaa, why, why, why … Chicaritoooo , da la la la la la laaaaaa….